This garden around my house is both part of a natural system and an interruption of it. Take nature’s system of feeding the soil with fallen leaves- a perfect cycle that we interrupt every fall when we blow all those leaves into the street to keep our yards looking tidy—Of course it makes sense to use these leaves in our gardens and not send them off, but how to manage the enormous piles that accumulate every November out front? For a few years, we’ve tried a variety of methods for shredding these leaves so they would lay neat and flat on garden beds like traditional mulch. The small reel mower we use to cut the patch of grass in our front yard can’t handle the twigs mixed in with the leaves. The electric leaf vacuum gets stuck with larger branches, and the gas mower with bag attached works well, but feels wrong to me. How much good can we be doing burning up nature’s fossil reserves to mimic nature’s fertilizing system? Last fall we decided to just rake all the leaves into the beds and leave them there. In November, I spent a lot of time trying to get my eyes to appreciate the look of garden beds piled high with leaves. The dry leaves blew out of the beds and back on the paths for weeks. Edges disappeared, and many evergreen ground covers like our Phlox stolinifera got buried in a pile of brown. The garden looked messy. A couple of months later, snow and wet have packed down the leaves. Messy is gone, replaced by a frozen crust. In another couple of months, we’ll shift our concern from aesthetics to logistics as we try to figure out how to efficiently break up the matted leaves so they decompose and don’t create a temporary barrier between the soil and the air and water above it. Organic garden is perpetually experimental- a balancing act on the pivot of a see saw that tips on one side towards humility in the face of natural systems and on the other towards the arrogance that makes one want to shape those systems to meet our needs and desires. About a year and a half ago, I looked at Backyard Bounty’s logo, whose central feature is a big carrot, and wondered whether it should change. I founded the company because of a passion for the type of gardens the French call a ‘potager’- a garden containing a mix of edible plants, herbs and flowers that create a home landscape that is beautiful and functional. As Backyard Bounty grew and evolved, I became increasingly passionate about native plants and storm water management, and, while we will always love designing and building kitchen gardens, I wanted to make sure our logo reflected the complete picture of who we are as a company. Considering different graphic options, I realized a couple of things: 1- that graphic design may just be the most difficult field of design out there, and 2- that the carrot, albeit modified to look a bit more ornamental, was the right logo for our company. One of the many lessons I’ve learned from Alice Waters work at Chez Panisse is that the metaphorical carrot can have as much power to inspire good stewardship as the metaphorical stick. Those of us living in Montgomery County, Maryland, are fortunate to have a Rainscapes progam that offers a valuable carrot to homeowners interested in doing the right thing- up to $2500 in tax credit to be applied towards the installation of a Rain Garden, Conservation Landscape, or Permeable Driveway. Thanks to all the folks who work to make it financially easier to create home landscapes that improve our environment. Signing on to adhere to the principles of Montgomery County’s Green Landscaper Certification Program inspires us to create beauty that is rooted in good stewardship. Gardens are carrots- full of pleasure in views, in flowering blooms, in the flavor of fresh picked lettuce…. When we design, build and maintain gardens responsibly, we re-charge our groundwater, keep pollutants out of streams, build habitats that preserve the diversity in our eco-systems, and conserve energy and limited natural resources. I’m excited to be part of this team that will lead county residents to create gardens that do good while looking good. How did it happen? The growing season is half way over and I have barely had a moment to reflect on it–to reflect on the jungle that has become my garden. In the beginning there was so much waiting and faith and then suddenly, the first tendrils of the peas and the tips of mesclun leaves peaked through and then suddenly spring had sprung. But spring is the craziest of times. A friend of mine says that May is the busiest month of the year, even busier than the holidays. I believe her. 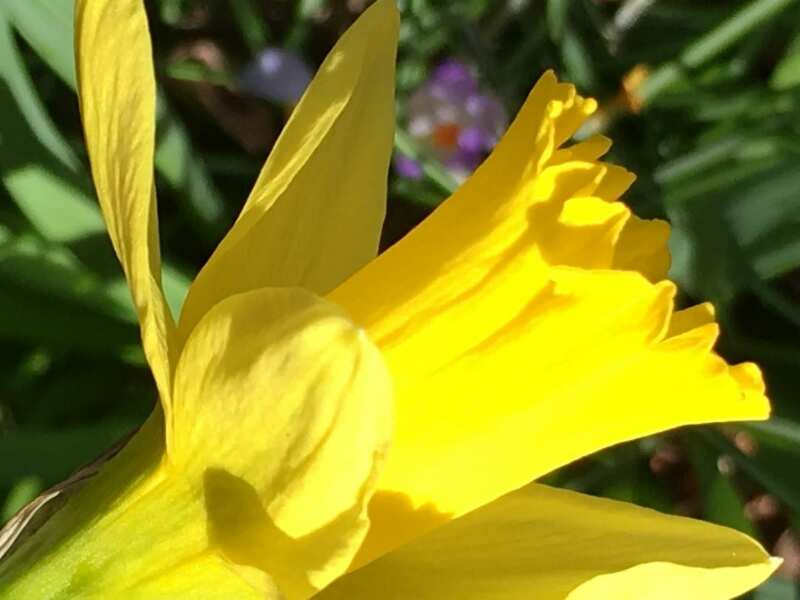 After all my careful preparations, other than watering, (or rather saying quiet thank yous for the rainy spring) I barely paid attention to my garden as I raced about my life. For one, I couldn’t tell the difference between tender seedlings and weeds. For another, spring is perhaps the busiest time of year with children (or at least my child). End of school year performances, baseball games filled the after work hours. Despite my best intentions, my garden became an afterthought. Mother’s Day weekend I put in some tomato plants and chilis and a couple of eggplants. Edamarie showed me how to dig them in so they would be stable, each plant requiring a slightly different–though not terribly complex technique. We pulled old cages out of her garage for support. We spent a couple of hours digging around together and I made a list of projects I wanted to complete (mostly having to do with taming the weeds in the alley that kept threatening my little bed), but work, family commitments, and the crush of spring schedules kept me away. I was certain that my inattention would kill it. 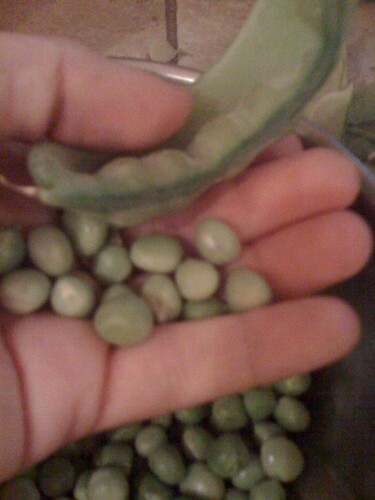 In early June Edamarie called me to tell me that my peas were ready to harvest. My first sweet (if small harvest) of peas and lettuce proved to me that this was not a dream. It also proved to me that sometimes action has nothing to do with it. Despite the fact I had not been at my garden bed nightly (as I imagined I would back in February), plants grow. They grow without me doing anything other than planting them in good soil and praying for rain. And sometimes, despite lots of loving care, they don’t. When I was planting my seeds the crop I dreamed of were my chioggia beets. When my garden was just a canvass of mud, I lovingly measured the rows and laid them down seed by seed, covering my hands in stickiness. But not one seedling popped up. Not one. Was it a bird who stole my seeds? Did I misjudge seed depth? Its a mystery that I am not sure I will solve. Its now July, and my garden is a jungle of lettuce that is still flourishing, (despite the crazy heat) chilis that are doing nothing (though all signs say this heat should have spurred them on! ), tomatoes that are producing green fruit (which have me paying close attention, waiting for them to ripen and fill my fridge with red juicy goodness) and invasive nasty weeds (that speak to me of the need for constant vigilance–and the importance of that alley weed eradication project I had forgotten in the spring). The carrots are still small and scrawny, the onions may never produce but I have enough greens to feed us salads every night. My garden is a metaphor of messiness and unpredicatability and mystery. It looks a little like my life, rough around the edges, full of lots of tasty goodness but not necessarily everything I hoped for. Summer is settling down and long hot evenings are opening up, allowing me to make way to the bed and pull out those weeds, pick my first ripe tomatoes beat back the bugs and try to solve the mystery of the beets. In the slowness that is unfolding now, I have time to make sense of the glorious growth, to cull and attempt to understand. This is what my garden looked like at the end of June, almost a month ago. Meg Casey is an activist and blogger and mom in Silver Spring Maryland. With the loving support of Edamarie, she is making a go at being an urban farmer and blogging about the new experience here. Our white Wisteria has been transplanted 3 times. First, from a pot in Montclair, NJ then, to our first home in Riverton, NJ and finally, to suburban Washington, DC. It is the first major bloomer in our spring garden, and every time I walk under it, I think about the New York Botanical Garden. Many years ago, I taught English in the South Bronx. Nothing makes you appreciate green like a daily commute on the Cross Bronx Expressway. Friday afternoons, rather than fight the exhaust and the massive lines of cars heading out of the city for the weekend, I would cross Fordham Road and walk into an urban oasis. 4:00: smell the sweet fragrance from banks of peonies blooming along the walk across from the perennial garden. When you look at the ugly, you have a hard time functioning without moments of beauty. Gardens and flowers are not a luxury. They are the sustenance that feeds hope. As the original customer and primary beneficiary of Backyard Bounty’s services, I can attest to the difference it makes in your life. Having come home from a long trip last night, I was greeted with a truly splendid sight that was both impressive and calming at the same time. While I was never a gardener, I can appreciate what it means to have a beautiful place to relax after a long day…. OK, maybe that last part is optional. Some people say that one of the hardest part about making a dream come true is finding the space for it to be born. Is it silly to say that about gardening too? It is certainly true about my dream of growing my own food. 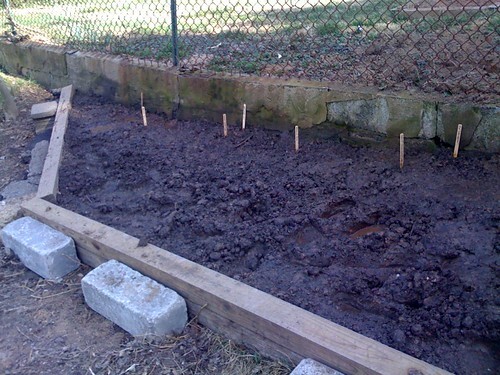 I think the hardest thing I will do in my garden this year is to create the blank canvass–to build that elevated bed where my veggies will grow. I have to be honest, it is wasn’t for the encouragement of my friend (and the pile of brightly colored yummy looking seed packets on my dining room table) I might have given up before I got started. The idea of having to build a bed felt like a scary and uncomfortable amount of work for this fully employed single mom. The process of building an elevated bed when spelled out in whole felt like so much that I wanted to simply go back to bed and wake up for the farmer’s market. Railroad ties, weed barriers, wheelbarrels of compost and topsoil… OH MY! But my peas wanted to be planted and I was already 3 days behind the Saint Patty’s Day “deadline” for getting them in the ground. So Friday morning, fresh off a red-eye flight I found myself in the backalley moving dirt. And what I learned is what I learn anytime I tackle a big project. The instructions in totality may be overwhelming but when I look only as far as the next step, each task is doable, even easy. The garage is full of cardboard boxes waiting to be turned into weed barriers, and it sure feels great to rip the pieces into the proper shapes. It does not take much work to move a shovel full of dirt into a wheelbarrel. It does not take much effort to roll a wheelbarrel across an alley. Railroad ties may be heavy, but they can be dragged. So can rocks. Taken step by step, piece by piece none of these things are hard, and while they take time, it really isn’t that much time, even for a single mom with a to-do list a mile long. Later that day, I reflected on how many hours I spend in the produce section of the grocery store, tromping to farmers markets and the coop. The four hours I took to build the bed was a marvelous investment. Furthermore, I was reminded again that leaving visions of perfection behind, and simply aiming for getting started is indeed the perfect way to move forward. Flexibility and creativity and using what we have right there can sure make the project easier. Sure, anchoring the wood with asphalt and rocks found strewn around the alley might not be the proper way (best to drill holes in the wood and insert rebarb or spikes in threw the dirt) but it works in a pinch, puts “garbage” to work, and best of all cost nothing and doesn’t require an extra trip to the hardware store. I will go back eventually to secure my bed properly, before the torrential summer rains which might challenge my rocks, cause my dirt to slip and slide and push the wood out into the alley, but for now an imperfectly built bed is better than none at all. Creating the space for the veggie dream to be born was a perfect way to spend the solstice, to honor the coming spring. Now, with seeds and mud as my medium, water, tools and nets, we can see what beautiful art we can create! Then I picked up the article on Femivorism from last week’s Sunday NY Times (another pause to chuckle at another stereotype), that I’ve been thinking about all week, and realized that the woman in the photo looks a lot like the women in the catalogues that have been coming to my house from Title Nine and Athleta. Would you be surprised if the next line of attractive sportswear offered by these companies was for pruning and digging? It’s comforting to know that a lot of the people you know want to connect to the rythms of the earth the way they’ve learned to connect to the rythm of their breathing. I came to NJ this weekend for a baby shower hosted by my oldest friend who is moving permanently to Carmel, California. We have different politics, but similar habits. My friend told me yesterday that her husband wants to plant a veggie garden on the slope behind their home. I picked up the latest copy of Eating Well magazine and learned that 7 million more Americans planned to grow their own food in 2009 than in 2008, a 19 percent increase from the year before. According to the article “Grow Your Own Food and Save Money with a Vegetable Garden,” more and more people are eager to save money and to eat food they know is safe. Why? Beyond saving money and getting fresh, local, organically grown food, the backyard garden is a place where you get to pause and breathe. Put a seed in the ground. Water it. Wait. You’ve just found a great excuse to grab some peace with very little guilt (well, “very little guilt” as long as you don’t feel pressure to plant the thousands of seeds you bought on an impulsive February morning when you were stuck inside during a blizzard…plant just a few and store the rest in the fridge. The seeds will last). Then, put your phone on mute, disconnect from your inbox and don’t look at the pile of laundry in the hall. Breathe again. Listen to how quiet it is when you sit still. Ever since I was a little girl I wanted to be a farmer. I don’t know where it comes from, this yearning to get my food from the land. Certainly it wasn’t my parents. Just a generation away from struggle they did everything they could to convince me that the “hard work” was more than I bargained for. I grew up thinking that my dream of living my adult life in Iowa in a big white farmhouse with sheep and pigs and fields of wheat and corn and fresh green veggies would simply leave me overwhelmed, overworked, poor and miserable. And from a political and economic standpoint, they may have been right. Growing food however called to me even as I grew. Some 15 years ago when my ex-husband and I first moved in together, our apartment had a front yard which faced south and was bathed in sunlight. Together with our upstairs neighbors we planted herbs, flowers, and a few tomatoes and chilis. We grew lettuce in a bed in the backyard. We only lived there one year. and that was a year of lots of learning through failure. We didn’t haul in a big harvest but we did play in the dirt and the potential was intoxicating. But then, we moved into the house where my son and I currently live. I love my house for many reasons but we almost didn’t buy it because of the lack of sunlight. it is surrounded by ancient, wide oak trees. The lawn has all but disappeared and in its place grows a thick carpet of green moss. Mushrooms and hostas and ferns thrive here. Veggies do not. So I joined a CSA, found a farmers’ market, paid more for the organic label at the grocery story and gave up my dream of growing my own food. Well, rather, I tucked it neatly out of site. Two summers ago I read Barbara Kingsolver’s book, “Animal, Vegetable, Miracle” and my dream lifted her head and started poking me. It seems so right to grow what we need in our own backyard. Many of my friends, much of my community have followed in the footsteps of Kingsolver and they are growing their own food. 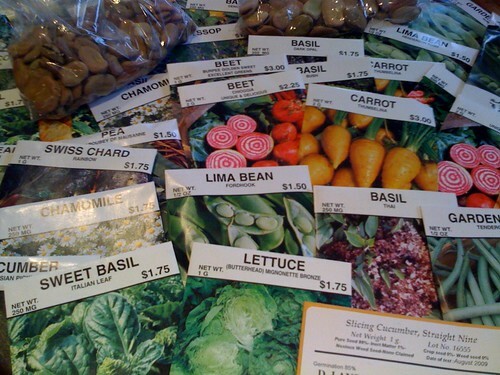 I have sat at many a table with the most delicious beets, the sweetest carrots, with salads picked right before dinner. I have shared in their bounty, bringing home extra cucumbers, tomatillos and peppers. I have made sauce from the tomatoes they could never possibly use. I have been a grateful consumer. But their generosity has only fueled my sense that something was out of place with a garden out of sight. That is why, this year, I am finding a way. Magic has arrived in the form of neighbors offering unused but sun drenched space in the alley behind their homes. I am building beds where beaten down weeds and ivy and trash cans once stood. I am borrowing a corner in my friend Edamarie’s yard and setting up an elevated bed. And I am experimenting with growing my own food, if not in my own backyard, then in the forgotten corners of our community. It started this winter, when January winds were still blowing, when I gathered with a gang of more experienced gardeners. I was a total beginner, out of my league but somehow in the sisterhood of these wise women I felt as though I could fine my way. It was worth a try. This Friday, my seeds arrived. I spread them out on my table and basked in all the promise that they offer. Promise of healthy food. Promise of heartbreaking loss due to bugs, or birds or drought. 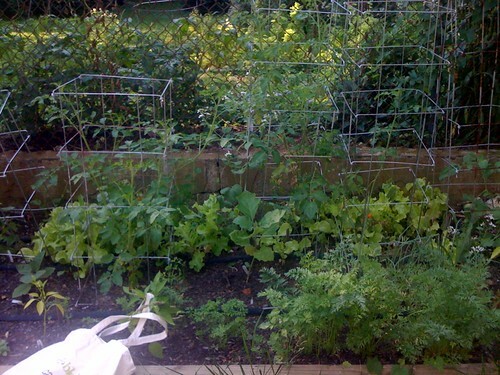 Promise that I will learn to accept what is, whether its a bumper crop of tomatoes or lost crop of peas. Promise of hours in the dirt, digging, hoping to coax something from the land. Promise that no matter what I bring home I will learn something, not only about the art of gardening but also about myself. Promise of adventure. Promise that, seed by tiny seed, I will manifest my dreams. Meg Casey is an activist, mother and blogger who has decided, with the loving support of Edamarie, to give urban farming a try. She will be guest-blogging over here this growing season, sharing her experiences with other brand new gardeners. You can visit her over at her home here.